How to Use Your Phone as A Webcam to Record Videos? The tools for online communication have changed the world as we know it. Today, we don't have to wait for days or weeks for the people to respond to our messages. Almost all PC and Mac laptops have webcams that enable us to make video calls or other types of videos that can be shared on social media platforms. But, in certain situations, such as when your laptop's built-in camera is broken or you are using a desktop PC without webcam built in, you can't really create a webcam video, and you might be forced to look for alternative solutions. For that reason, in this article, we are going to show you five different ways how to turn your smartphone including iPhone and Android phone into a webcam in order to create high-quality webcam recordings. How to Turn Your Android Phone into A Webcam? A camera on your Android phone can be easily connected to a computer and turned into a webcam. If for some reason you can't use the camera on your laptop and you don't want to spend money on purchasing an external webcam, then these methods of turning an Android phone into a webcam video recorder may assist you in producing a great presentation or sealing an important business deal. Google Play grants you access to a lot of different webcam apps, but most of them don't provide a high-quality service. IP Webcam application performs better than most of its competitors, and it enables you to quickly connect your phone to your computer through the Wi-Fi connection. In order to turn your Android phone into a webcam, you'll first have to connect both your computer and your Smartphone to the same Wi-Fi network. Once you've accomplished this, you can proceed to download and install the IP Webcam app on your Android device. Make sure that all other apps on your phone are closed and launch the IP Webcam application. We recommend you to set up your login and password in Local Broadcasting under Connection Settings Tab for security reasons. Locate the Start Server feature within the app, tap on it and the app will show you a URL. Insert the URL displayed on your phone's screen into Chrome or FireFox web browser on your computer and press Enter. Now that the new webpage is loaded, you should look for a Video Render drop-down menu and select the Browser option. Head over to the Audio Render menu and click on the HTML wav feature. After completing these steps, you can start a recording session directly from the web browser you're using by clicking the Record button. You can also copy the URL displayed by on the phone's screen into the VLC Media Player to record the video. That’s how to turn your Android phone as a webcam to record video by using the IP Webcam app. You can also download the IP Webcam Adapter on your computer too and then use your Android as a video source for Skype video chat. Check the video made by CNET and find out the specific steps. Enabling the Developer mode on your Android device is the first step you'll have to take if you would like to turn your phone into a webcam via the USB port. Once you are in the Developer Mode you have to switch on the USB Debugging option. Here's how you can do this. Open the Settings menu on your Android phone and tap on the About Phone feature. You'll be able to see the Build Number option, tap on it several times and the Developer Mode on your phone will be enabled. Go to the Google Play Store and download the DroidCam application to your phone, and repeat the same process from your computer. You can find the installation for the PC version of the DroidCam app at this link. Connect the Android device to a computer via the USB cable. Make sure that the app is open on your Android phone and your computer, and then click on the USB tab in the app you've launched from your computer. You can also switch to the Wi-Fi connection if you prefer. But to make it work, you need to ensure that the DroidCam and your PC are using the same wireless network. Clicking on the Start icon will enable you to gain access to the phone's camera. If everything seems to be in order, you can commence the webcam video recording session. You can use either the light or the regular version of the Wo Webcam app to turn your phone into a webcam. The app lets you connect your devices via Bluetooth, Wi-Fi or USB, so you can choose the method you find the most convenient. Before you can start recording a webcam video you must first install the Wo Webcam app on your Android device and a Wo Webcam client for PCs. Afterward, you have to make sure that both devices are connected to the same Wi-Fi connection. Launch the app from your phone and head over to the Settings menu. Tap on the Transport feature and then select the Wi-Fi option. 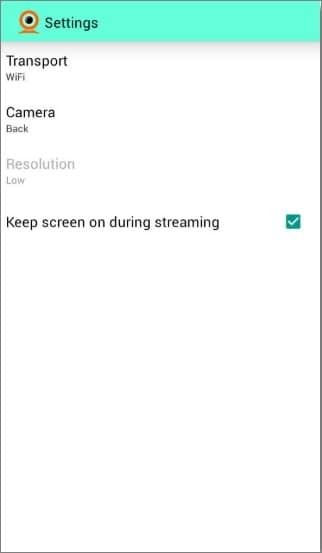 The 'Keep screen on during streaming' checkbox should be checked to ensure a smooth and uninterrupted webcam recording session. While still on your phone, hitting the back button will enable you to see the Wi-Fi address displayed on the device's screen. Hit Start, and remember the Wi-Fi address, because you are going to need it in order to successfully connect the two devices. 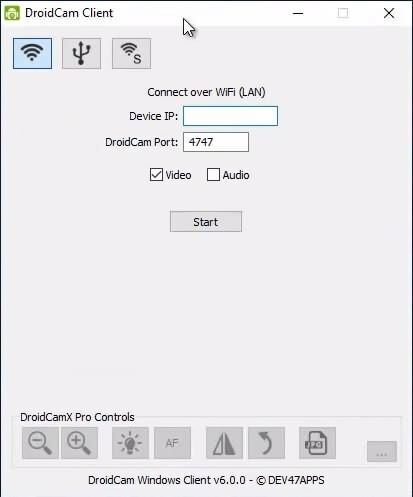 Start the Wo Webcam client from your computer, and locate the Connection menu. 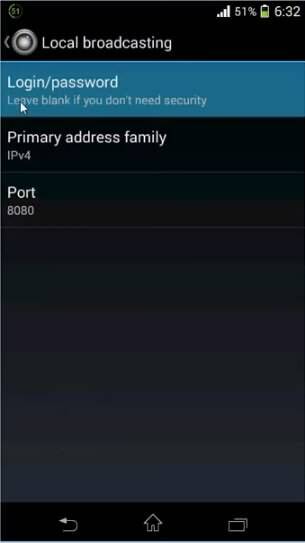 Click on the Connect option and proceed to enter the WiFi address displayed by the app on your Android phone. After the two devices are connected you can start using your Smartphone as a webcam. iPhone cameras are famous for the high-quality video recordings they can produce, which makes them a perfect choice for a webcam. You can use these apps to quickly connect your computer to an iPhone or an iPad. The best part about using the EpocCam app to turn an iPhone into a webcam is that the setup process is completely automatic. You just have to download the drivers to a Mac or PC computer and you can start a live video chat. However, the basic version of the app offers limited options, so if you want to enjoy the full capacity of this app, you should download the EpocCAM HD. Besides turning your iPhone into a webcam, this app also lets you use a flashlight when recording in difficult light conditions, as well as to adjust the focus or fine-tune the audio recording settings. For just $4,99 you can purchase the WebCamera app at the AppStore, that turns your iOS device into a webcam. Install the app on your iPhone or iPad and then download the WebCamera client to your computer and start the installation process. Launch the app from a computer and connect it to the iOS device of your choice via the Wi-Fi connection. Once they are connected you can start using your device as a webcam in all of the most popular chat programs. The process of turning a Smartphone into a webcam is simple and it can help you improve the quality of your webcam videos. Lets us know which method you liked the most in the comments section, and make sure to share these five amazing methods of using a Smartphone as a webcam with your friends on social media.